Do you suffer from tired, achy, and perhaps even swollen feet? Americans today are experiencing these symptoms from shoes that are poorly designed and ill-fitting that inhibits natural foot functions. A new treatment concept has been introduced that will change the way we view our feet. The proposed new treatment involves the most humble of all clothing – the sock. Until recently, the sock has not been designed for any purpose other than to cover the foot inside the shoe. Introducing a new product that is designed to bring your foot to its natural state and eliminate foot discomfort almost entirely. FootGlove PF – The Ultimate Foot Support Sock. 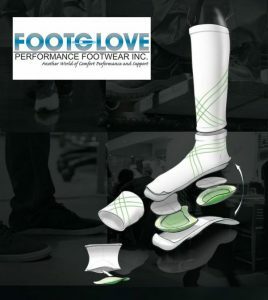 FootGlove PF utilizes a unique innersole foam pad coupled with multiple types of fiber that directly affect the environment of the foot. Compression, tensile properties of the fibers, and their composition are used to both support and cushion the foot. This incredible design is not only extremely comfortable; it will offer capabilities to treat specific foot ailments. Utilizing this concept, FootGlove PF will become the new center of preventive and therapeutic support and protection. FootGlove PF has such a high quality feel, it is nearly impossible to want to take them off! Imagine well-fitting socks that fit like a glove, keeping your feet comfortable and you happy! Prepare to change the way you view socks forever. FootGlove PF is here to improve the condition and aid in the protection of your feet by providing high level support, unmatched cushioning, and therapeutic results. Be sure to follow our KickStarter Campaign starting April 2, 2016!